Challenge #9 entitled "bottle" was original and worth its 500 points. We were given the following network capture and instructed to find a message. Opening the capture in Wireshark reveals a lot of DNS traffic (and 4 ARP requests): it definitely looks like a DNS tunnel. Basically DNS works with client requests (DNS QR) and server responses (DNS RR), so the real data are in QR.qname and RR.rdata respectively. View the entire overview here. We see that the client sends its version, then the server replies OK and gives the login challenge 'D\x03\xc5\xe9'. Good, it is using protocol version 502, the latest. Login sequence, break the password! Wow, we are lucky! But dammit, it is not the flag :) it was worth trying anyway. This indicates that the upstream data will be base128 encoded. We will use the C program (encoder.c) and python wrapper previously mentioned to decode it. Obviously, before the base128 decode we have to remove the top domain as well as the inner dots. encoded with the chosen upstream codec. In NULL responses, downstream data is always raw. Looks like a valid packet! Good, we are able to decode upstream packets. Looks like a valid packet! Good, we are also able to decode downstream packets. Seeing that packets were captured in a LAN, we can reasonably assume packets are in the correct order, thus the only thing that remains is to handle fragmentation and reassembly. input, output = "bottle.cap", "extracted.cap"
Woohoo! The extracted network capture is available here. 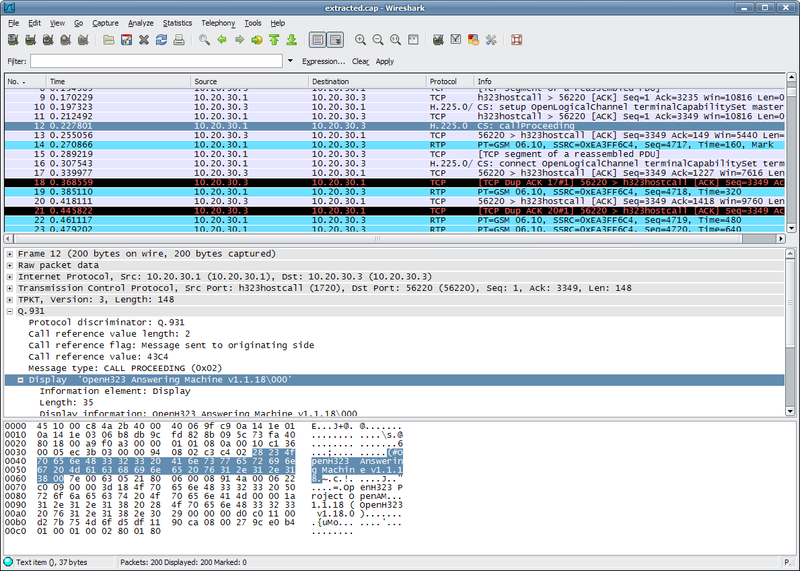 We see nothing interesting in the VoIP/H.323 signalisation: looks like a "root" user is having a conversation with an Answering Machine using product OpenH323 Project OpenAM version 1.1.18 (thanks Wireshark for dissecting all these fields!). The full script is available here, as well as the resulting audio.gsm file. Then how do we listen to a raw GSM audio file? For those who worked on Defcon 18 quals forensics 300 (see writeup by team routards) or followed my twitter (@stalkr_), we already know SoX - Sound eXchange, the Swiss Army knife of sound processing programs. Note for debian users: install package sox but also libsox-fmt-all to have GSM format as well. Thank you fluxfingers for this awesome CTF with great challenges. And also congrats to iodine guys because it is a great software! very nice writeup and good job!